Our hearty Cauliflower, Kale & Carrot Chopped Salad is open for business and ready to delight, even on the go! In as little as 15 minutes you’ll be set to enjoy tons of tasty layers using just a handful of fresh ingredients. 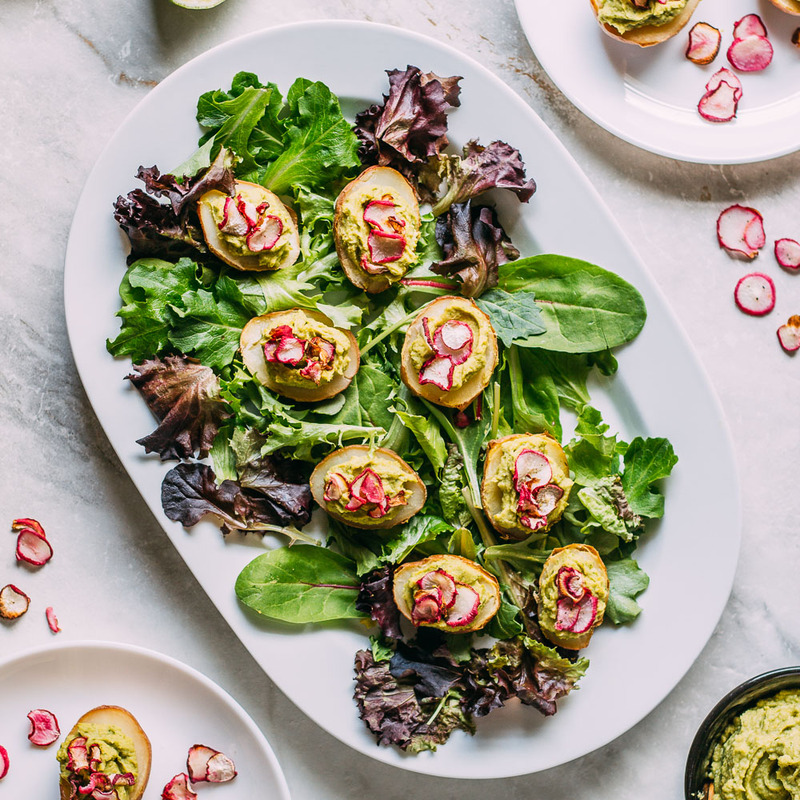 Nestled among all of the hearty veggies we’ve used our homemade Hemp & Dijon Mustard Dressing that grabs your attention and makes this salad sing. Cauliflower, Kale & Carrot Chopped Salad tastes incredible all the way down to the very last bite! 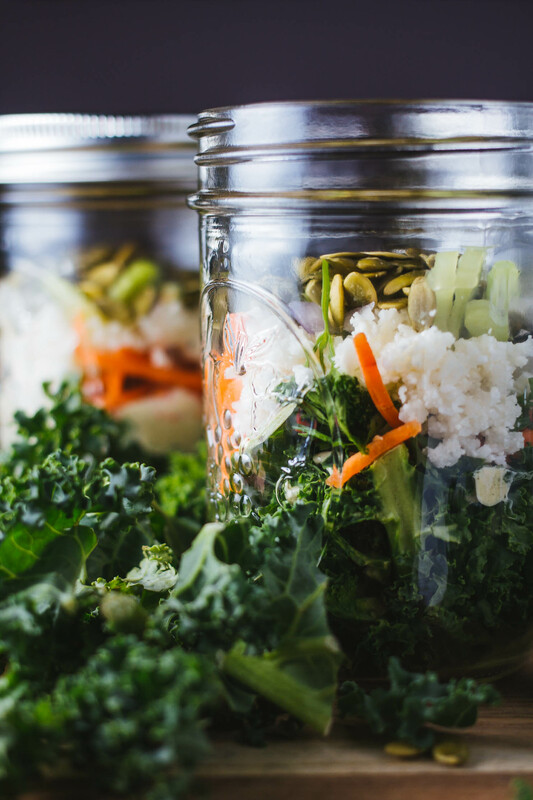 Our convenient make-it-and-take-it recipe for Cauliflower, Kale & Carrot Chopped Salad is destined to be one of those fresh raw favorites you return to time and time again. And you won’t be coming back just because it’s a super easy to make, super nutritious, or super fun to munch. You’ll return to this salad because it tastes fantastic! 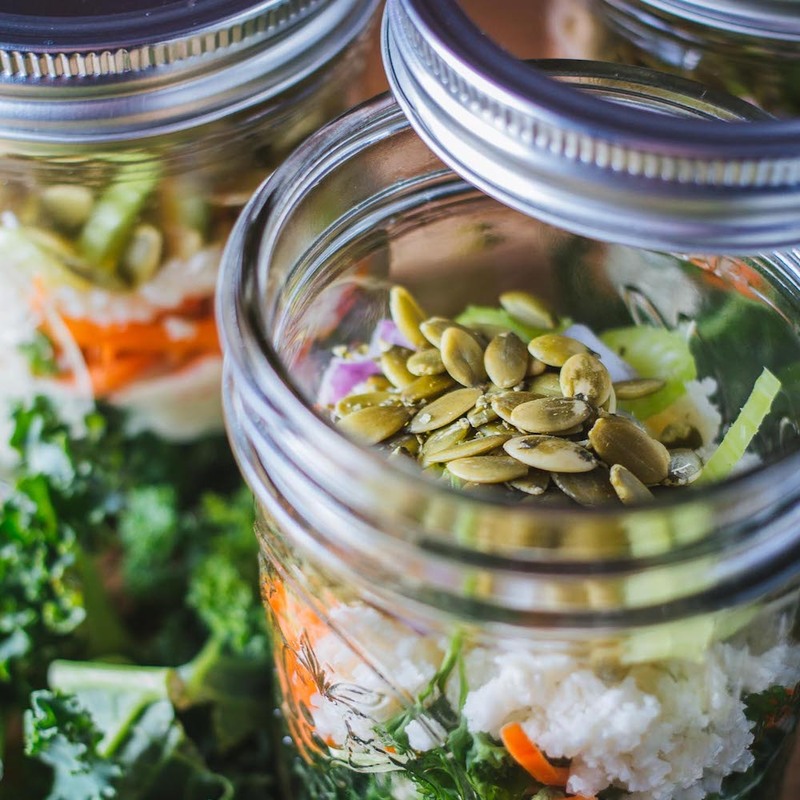 Each salad jar contains just the right amount of deliciousness dished out in serving-size portions making them ready-to-share and devour. What’s not to love about a hearty salad that’s already chopped, dressed and ready to enjoy? 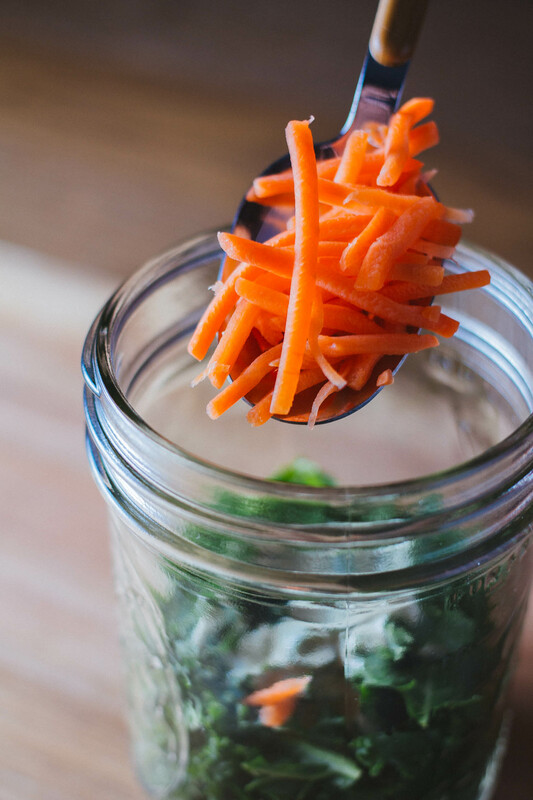 A Cauliflower, Kale & Carrot Chopped Salad would make a perfect intro to dinner. Of course, you can also enjoy this salad all on its own since nutritionally; it’s OFF the freaking charts! 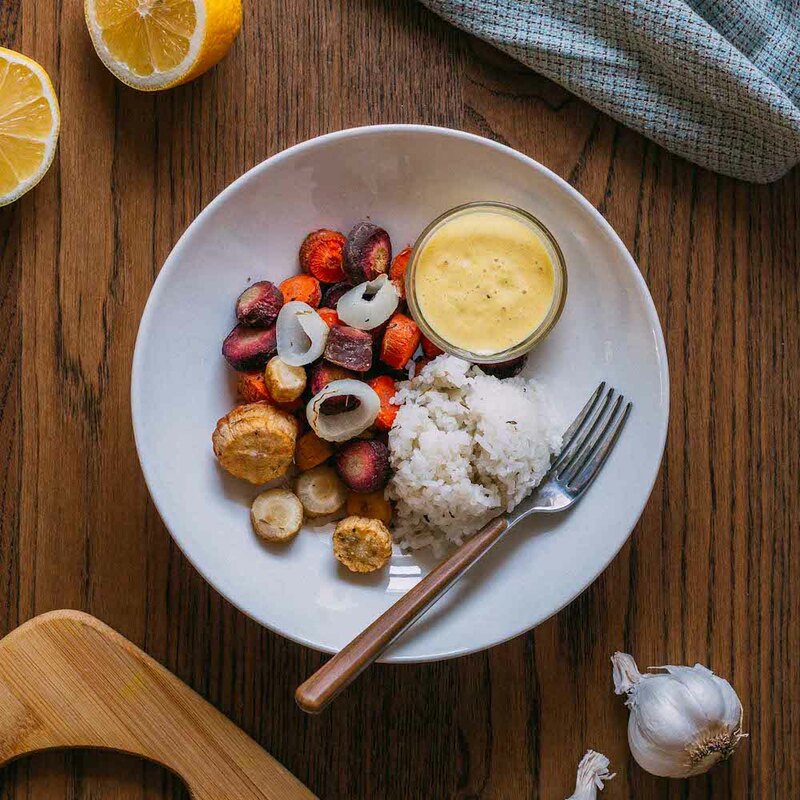 We are thrilled to share that in one serving there’s a full day’s worth of Vitamin A and a hefty portion of iron and protein, too. So a few portions tucked away in the fridge means, ta-dah, you’ve got a healthy lunch, already packed! 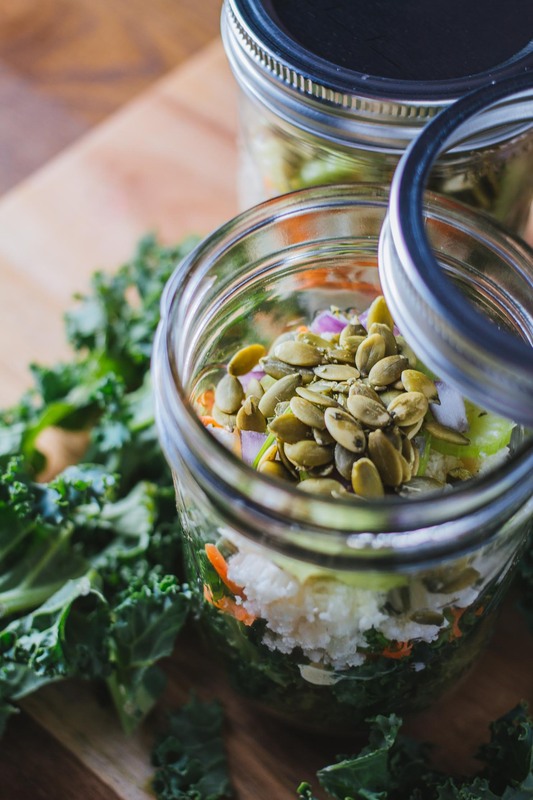 Don’t you just LOVE the whole hearty salad in a jar idea? I know that I sure do! One last thing, individually portioned servings of Cauliflower, Kale & Carrot Chopped Salad make terrific party food. 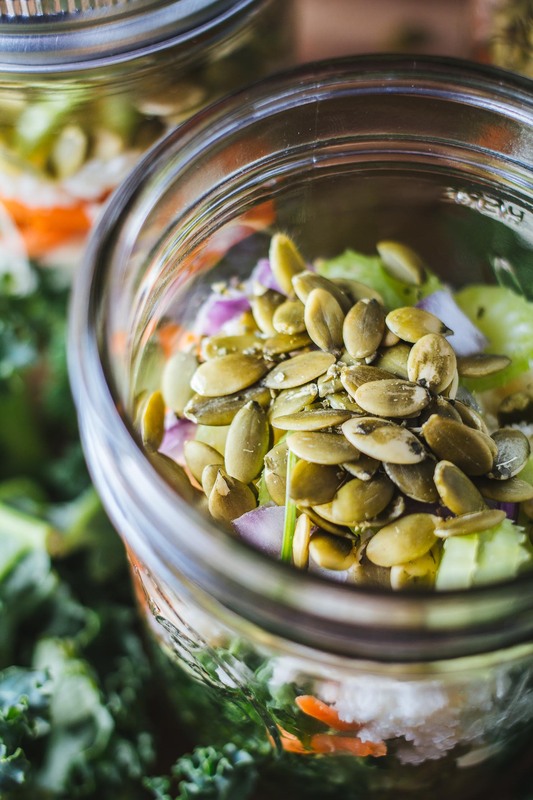 Since every salad ingredient, including the dressing, is already tucked inside the handy jar, guests just pick a salad, grab a fork, dig in and enjoy! 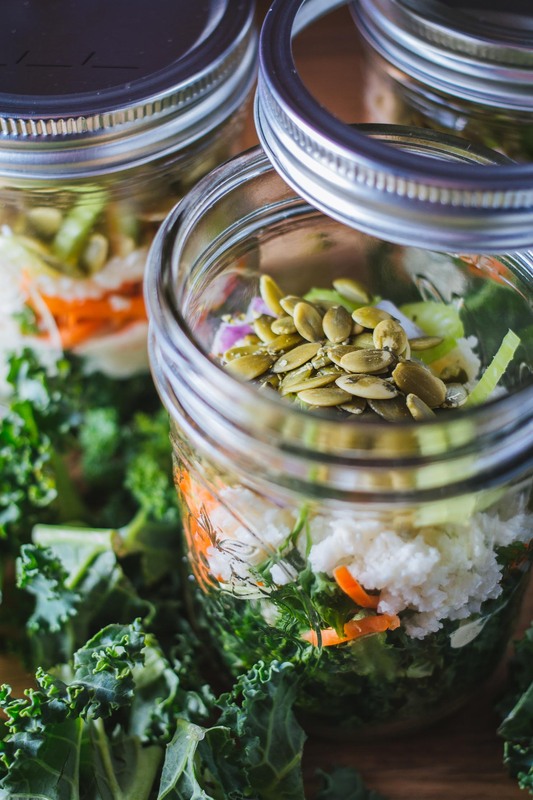 Salad filled jars look adorable on a picnic table and would be simply irresistible when accompanied by a basket filled with of our melt in your mouth, Gluten-Free Cornbread Muffins. The time is always just right for this spectacularly savory, crunchy, raw, vitamin-packed, easy to prepare, make-ahead, Cauliflower, Kale & Carrot Chopped Salad! 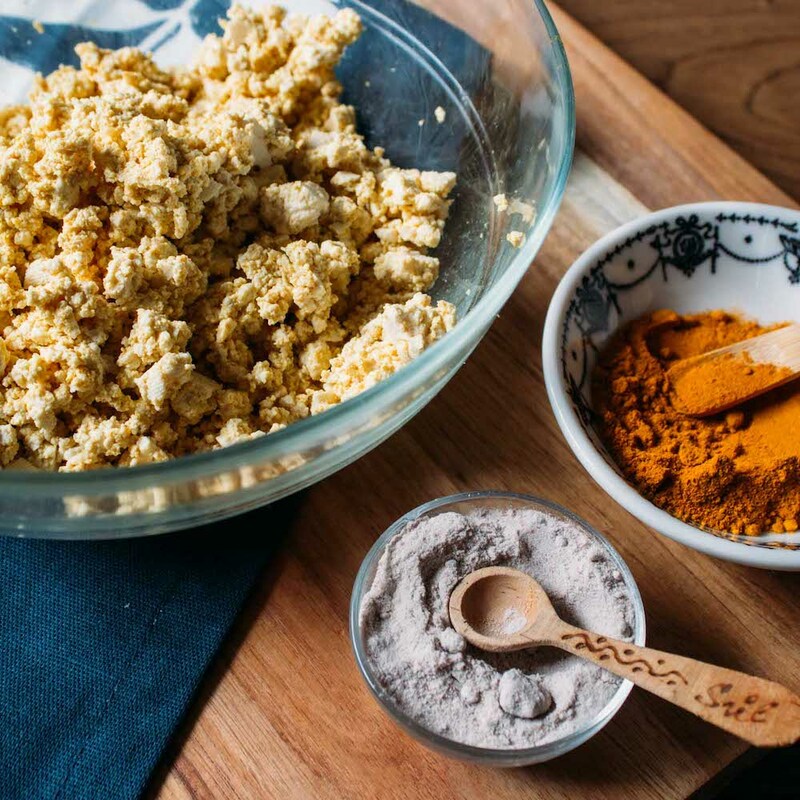 This recipe makes loving yourself and eating more healthily, simple and convenient! To speed preparation along purchase the veggies pre-chopped! And while I prefer that you make my nutritious Hemp & Dijon Mustard Dressing, if you want to use a bottled dressing with wholesome ingredients, I’ll forgive you. First, wash and trim the kale into bite-size pieces if you aren't using organic prewashed, chopped and bagged kale. No matter which kale you are using, thoroughly massage the chopped kale with your fingertips to soften the leaves. Next, chop the remaining vegetable ingredients and set aside for layering after you've made the dressing. While I prefer that we all buy the freshest organic vegetables we can find, prewashed veggies are way better than no veggies at all! So to save time purchase the vegetables prepped and ready to go. 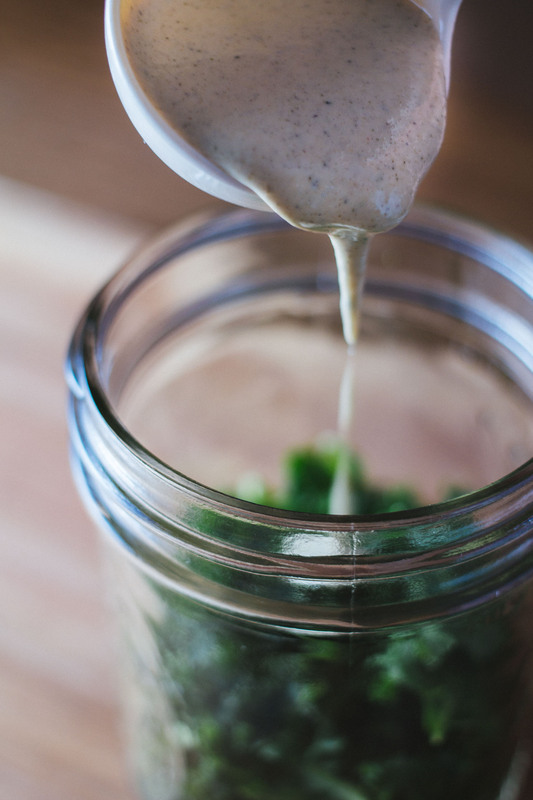 Now, in your handy dandy food processor or high-speed blender, make your batch of my equally nutritious and delicious Hemp & Dijon Mustard Dressing. Eat right away or cover and refrigerate to store. 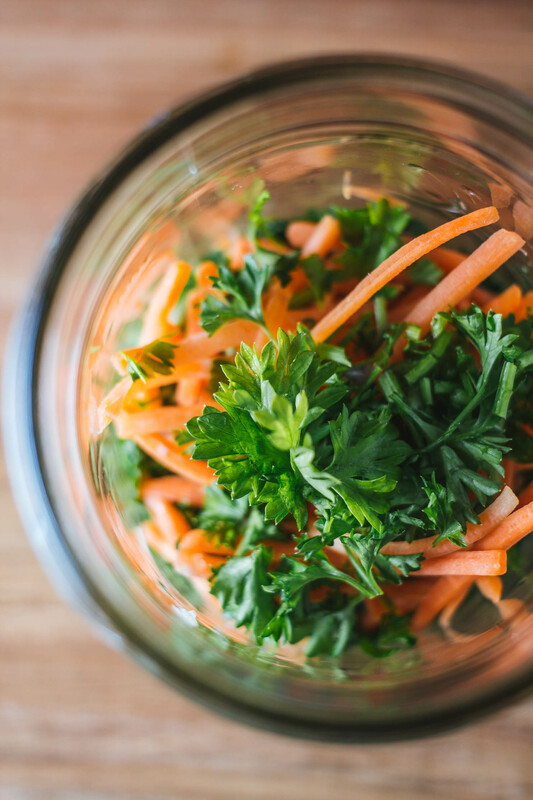 Cauliflower, Kale & Carrot Chopped Salad will be fresh and ready to go when you need them for the next two or three days. Serve these beauties before your next cooked meal or enjoy alone for a fast lunch or healthy snack. As mentioned above, to save time in the preparation of our Cauliflower, Kale & Carrot Chopped Salad, purchase pre-sliced organic carrot sticks and bagged chopped organic kale that's ready to use; cauliflower crumbles are also a terrific option to speed things along in this recipe.